All information here may change without further notice. I strongly recommend to follow the discussions at the HEADWIZE DIY forum . First published in May 2005.
Corrections added in July 2006. English is not my native language and i would like to apologize in advance for the humbly grammar, spelling, expression etc.. I like to thank John Broskie from TubeCad and Pete Millett for the inspiration i found when reading their webpages. Both had many words in favour for a portable hybrid amp. Now this little project is an example how this can come into being. Thanks go also to the nice people at the HeadWize forum who always provided good ideas. The force of so many enthusiasts drove me forward. Special thanks go to Paul Reid. His tube knowledge is enormous. Last but not least: A big THANK YOU to Chu Moy and his companion webmasters and hosters for giving us a home. Generally spoken, the YAHA should combine tube sound with the current capability that is needed to drive low impedance headphones. - Last, but not least: Easy to build. “There is nothing new under the sun”. Basically, this is a grounded cathode voltage amp followed by an opamp buffer. 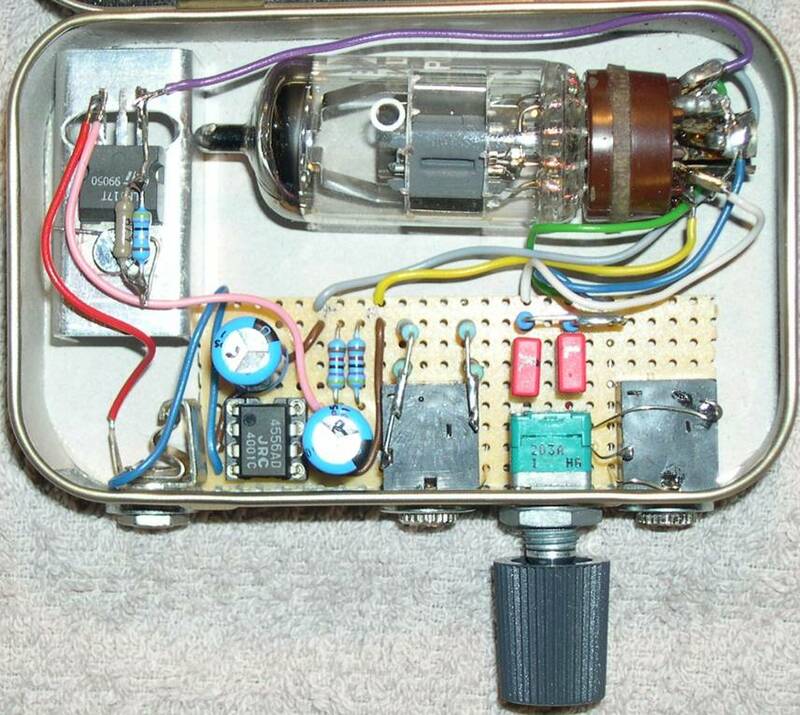 For full understanding ignore the opamp stage and look at the tubed voltage amp. Just cut (in memory) the wire between the tube and the opamp (+) input. The triode is fixed-biased by the grid-charge current that flows through the 1meg resistor. The hot cathode always emitts some electrons that have enough energy to fly up to the grid. following Ohm´s law builts up a negative voltage between grid and cathode = ground. This way of biasing works for many small signal tubes like 6DJ8, ECC88, 6922 but also for 12AT7, 12AX7 etc.. It works for pentodes as well, like DAF96, 1T4. It won’t work for power tubes like 2A3 or so because the bias voltage is in the range of -0.3..-0.8VDC only. It´s written in the books. It is that value named “max. grid resistor” and often is combined with the type of bias: Automatic or fixed. Choose the value for “fixed”. If the book says “fixed bias” this is for an external negative voltage to be applied to the grid. If the book says “automatic bias” this is for the bias acquired by a cathode resistor. Most books don’t say anything about “grid-leakage bias” !!! If there is a value, use it. If not: Use the value for automatic bias and multiply it by 10. In my circuit the R1 value should be up to 10 megOhm . The circuit works ok for R1 = 1megOhm but one can be sure that there is a small amount of grid current flowing. Here is a procedure how to get a value without curve-tracing. series or want to use other supply voltages. Always adjust the plate resistor to consume 1/2 to 1/3 of the supply voltage. If you try pentodes the plate resistor may consume up to 2/3 of the supply voltage. Start with a high value, up to 200kOhm, and adjust to lower while continously measuring the voltage between plate and B+ until it fits. Now take the adjustable resistor off the circuit and measure the resistance. You now may choose the standard value nearest to the result of the measurement. An amplified input signal can now be seen at the opamp (+) input if we “repair” the wire we cut above. The opamp in the prototype is an NJM4456 dual opamp. It is able to feed as much as 70mA into a 150 Ohm load. The NJM is not as “hot” as modern opamps with enormous high gain-bandwidth products. So it is not very likely that you will have problems with noise or oszillation. You may also try other opamps like NE5532 or OPA2134 or so. Make sure that they are “unity gain stable”. That means they will work flawlessly at a gain of 1.
and therefore sits at 1/2 of the supply voltage, too. You could use a standard buffer like the BUF634, too. It is more expensive, provides even more current and you need two of those. The result is the same: The output follows the input and sits at 1/2 B+. A better way is to put a MOSFET source follower as a buffer behind the opamp. We do not like to feed the headphones with DC, so we need to go with an output cap. Warning: Never go without output cap, otherwise your headphones (and probably your ears) will be ruined immediately. You may use an electrolytic of 220uF for cans above 32 Ohms, like the PortaPro or SportaPro. You should use 470uF for lo-Z headphones. Some people put a small film cap in parallel to the electrolytic to have better high frequency response. Important: Watch the polarity of the cap. The + side of the cap goes toward the opamp output ! Essential are the two resistors after the cap. This one, to ground, will allow the cap to charge at power on. This helps to minimize the POP when you connect the headphones. You should connect / disconnect the headphones always if the amp is up and running. You won´t notice POPs and this helps to preserve the sound qualities of the headphones. The bleeder resistor should be about 10 times higher than the value of the headphone impedance plus the output resistor value. The output resistor is chosen between 22 and 150 Ohm depending on which final gain the amp should have. The output resistor forms a a voltage divider together with the headphone impedance. As a rule of thumb choose the low value for high-Z headphones (>=250 Ohm) and the high value for lo-Z headphones (32 Ohm). Changing the value of the output resistor has _some_ effect on the sound and the stability of the opamp stage. The NJM likes load impedances of 100 Ohm and higher best. This is done by an LM317T voltage regulator wired as constant current source. 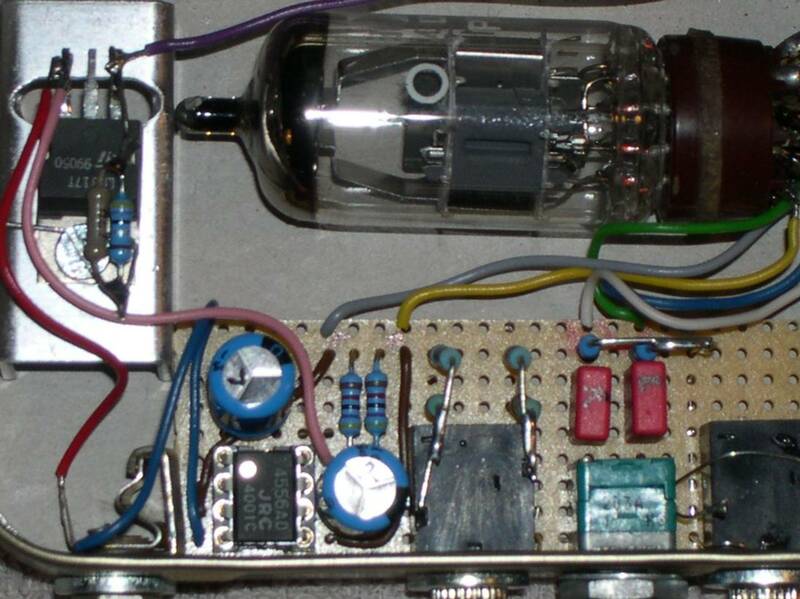 You only need one for two channels because the tube is a double triode, having two triode systems inside. Check the tube data: The 6DJ8 is fired with 300mA constant current or 6.3VDC constant voltage. We choose constant current. This is easy to achieve with the LM317 and an additional resistor. I am the least talented case builder under the sun so I always prefer readily available boxes. This one is an Altoids “Winter Green” tin. I guess it works with any of those Altoid tins. I don´t know if it works with Fisherman´s friends, too. I will test it if someone sends me a box of Penguin mints (hint, hint). The tube socket was a standard bakelite chassis mount type. I had to “Dremel”-away some material to get it fit into the box. All resistors are standard 1/4 watt metal film types. 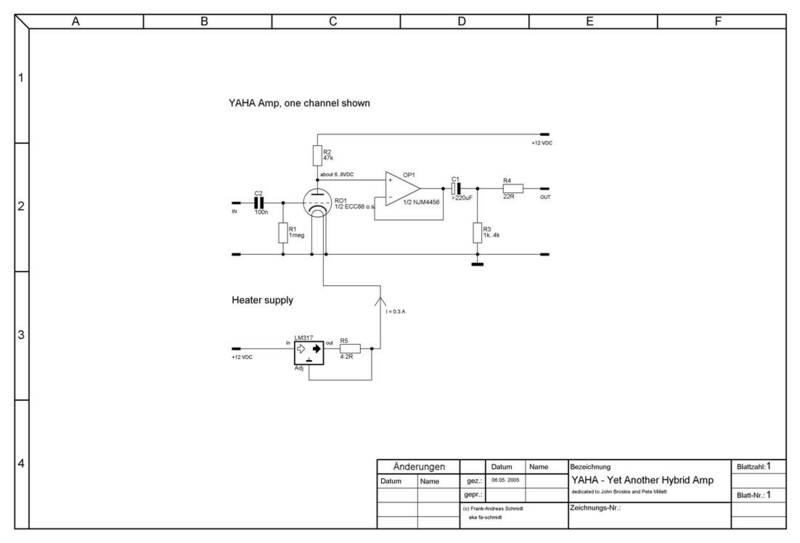 The circuit diagram does not show the small Alps pot serving as a volume control. The value is 10kOhm but it may be as high as 100kOhm as well. You can leave it out if you have a volume control with your source. at least 1 watt. The configuration of my amp is not bullet-proof. Because I use 1/4 watt resistors in parallel. They get really hot ! to ground if touching bare metal. Addition: DIGI01 from the HeadWize forum made some. Check for it at HeadWize ! 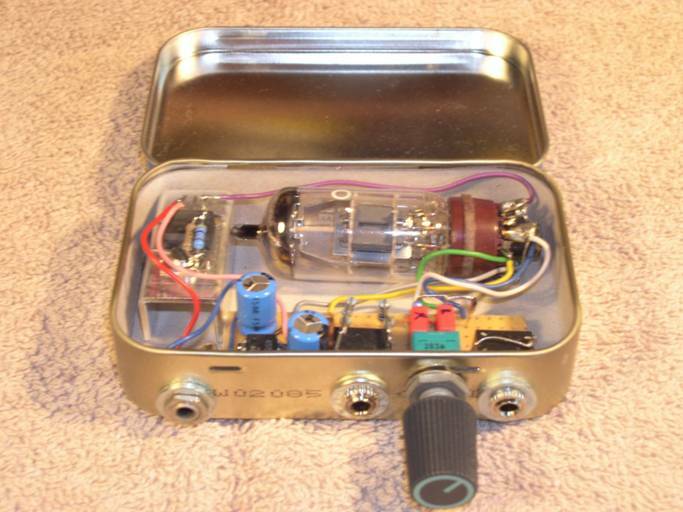 Building this amp was fun, but sometimes a drag because of the small enclosure. As you see 12VDC are necessary to power this amp. It consumes a little more than 300mA. You may use a batt pack of 10..12 NiCd or NiMh rechargables giving you about 5 hrs. of continuous listening if you choose 2000mAh cells. Or power it off your car battery if you go for a camping trip. Use a wall-wart at home, preferably a regulated and well filtered one. Try solar cells if you live in a sunny place. Oh, well. After you had such a hard job to build this amp it is very unlikely that it sounds bad. are far from being linear. ps. So it really is a task someone else should perform. I think the distortion is of mainly even order, as characteristic for triodes. I experienced the sound being very warm, easy to listen to. Not that sterile as transistor amps and not as aggressive as some opamp based amps. I think the NJM and the 6DJ8 are good companions giving a nice and unfatiguing listening experience. load impedance of 53 Ohm. This is the absolute maximum and the amp will distort heavily. But I admit that I did not listen at that level. My oscilloscope and a dummy load did that for me. A 53 Ohm load impedance consists of the 22 Ohm output resistor in series with an about 30 Ohm dummy load. I hope for lots of comments. If the feedback to this circuit is big enough I will try to convince Chu Moy to make an article for the project library of HEADWIZE. My webspace is not big enough to hold more than these few pics and this will not change until my hometown finally is connected to DSL. At the moment there will be no way for me to have step-by-step instructions to answer all questions. If my time allows it I will carefully answer all your questions. Including the corrections I made this file was sent to Chu Moy on July, 10th 2006.